LIFE credit stamp and LIFE limitation stamp on the back. Margaret Bourke-White, Halfway to freedom, A report on the new India in the words and photographs of Margaret Bourke-White, Simon&Schuster, 1949. She is best known as the first foreign photographer permitted to take pictures of Soviet Industry, the first female war correspondent (and the first female permitted to work in combat zones) and the first female photographer for LIFE magazine, where her photograph appeared on the first cover. 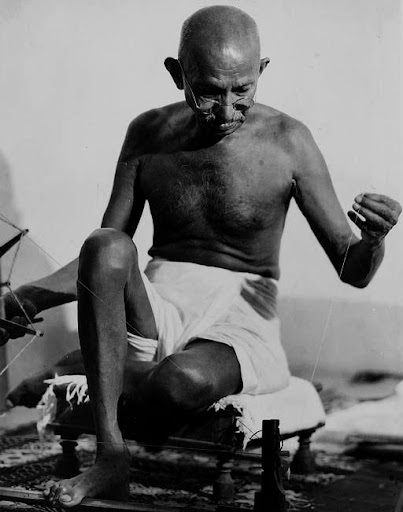 In Margaret Bourke-White's book Halfway to Freedom the caption accompanying this photograph describes the Charkha or the spinning wheel as a great symbol of India's fight for independence and hope. Spinning became a positive, productive, nonviolent way for the individual to personally participate in the struggle. Source: Sengupta, Somini, Bearing Steady Witness To Partition's Wounds, an article in the Arts section, The New York Times, September 21, 2006.